Sarson Ka Saag - This Sarson ka Sag recipe is an ideal dish to prepare some special festivals like Vaisakhi, Gurupurb, Diwali and some other occasions. 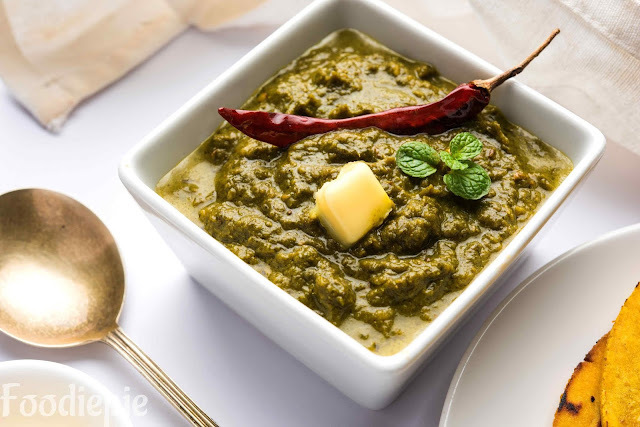 This nutritious dish is a full of taste and health.Sarasan ka Saag is a popular Punjabi recipe prepared with a combination of mustard leaves, spinach ,bathua, which are rich in amino acids and iron, and they provide more nutrition than other vegetables and foods. This white butter-leaved dishes is an authentic Punjabi dishes, which is often enjoyed during winter.When you serve it with some sweet delight like lassi or kheer, it tastes best. However, serving this easy Sarasan da Sag Recipe with Lassi makes it a healthy combination because Lassi makes from curd and water. and curd makes it easy to digest.Now let's checkout recipe first. Step 1 : Clean the mustard greens, remove the stems, break the leaves and separate them. Wash the leaves with clean water, remove excess water, and cut the leaves finely and prepare them.Similarly, clean the spinach too, remove the thick stems, wash the soft leaves with clean water, remove excess water and prepare them with finely chop. Wash the leaves of Bathua. Step 2 : Wash the tomato,green chilies,and ginger well and mix them in a mixer jar and make a paste. Step 3 : Take the cooker, add mustard, spinach and bathua leaves, by adding half a cup of water, close the cooker and cook till 1 whistle. Turn off the flame when the whistle comes in the cooker and let the pressure cooker end. Step 4 : Heat 2 tablespoons of oil in a pan and add cumin seeds, fry cumin seeds for a minutes then add asafoetida,turmeric powder and coriander powder and fry a little bit. Step 5 : Now add corn flour(makki ka atta) in it and fry it lightly, stirring continuously. Now add tomato, green chili and ginger paste to it and fry until the spices oil begins to separate from the oil. Step 6: Open the cooker and mash the vegetables with a spoon.You can use electric masher for mashing it. Step 7 : Once the spices are fry, add mashed saag to it, then add red chili powder and salt in it. Step 8 : Now add 1 cup of water and green coriander and let the saag cook well on a slow flame for 10-12 minutes. stirring the saag every 1-2 minutes. Finally : Sarson Ka Saag is ready serve with hot Makki di roti and Lassi.